NORWALK, CT - As a leader in Long Island Sound and ocean conservation, The Maritime Aquarium at Norwalk is doing its part for the environment by significantly reducing its employ of single-use plastics. Gone from the Aquarium’s cafeteria and theater concessions stand are all drinking straws. Guests now have the option of boxed water or beverages in glass and aluminum containers, instead of in plastic bottles. Additionally, plastic silverware, coffee lids and food containers have been replaced by biodegradable substitutes. In the Aquarium’s gift shop, plush animals no longer are stuffed with plastic beads, toys no longer have cellophane wrapping, and purchases no longer go into plastic bags. • Recycled plastic bottles don’t become new plastic bottles; they can only be “down-cycled” into lower-quality materials. • All straws and plastic soda-cup lids are eliminated. Even paper straws are not offered. • Water is now sold in paper boxes, instead of in plastic bottles. • Sodas in the Café, and also in the IMAX Theater concessions stand, are sold in aluminum cans. Juices and teas now are sold as boxed drinks and in glass bottles. • Coffee cups and soup cups are now made out of a paper coated with polylactic acid (PLA), which is produced from renewable resources such as corn and sugarcane, instead of petroleum. • Plates and the containers for hamburgers all made of a sugar-based paper. • Coffee-cup lids, knives, forks, spoons, salad containers and specialty-sandwich containers are made from a biodegradable cornstarch-based plastic. • Ketchup, mustard and other condiments are available only in large pump containers, for adding into small biodegradable paper cups. Gone are little plastic squeeze packets. • Cookies and candies are sold in biodegradable cellophane. About the only things still sold in plastic are yogurts, juice boxes and Uncrustables® sandwiches. But the Aquarium is actively seeking alternatives for those items as well. • Guests’ purchases no longer are placed in a plastic bag. Instead, guests are invited to purchase a reusable tote made from recycled plastic. • Plush animals no longer are stuffed with plastic beads. Some plush creatures are made entirely from post-consumer plastic bottles. • Toys, such as dolls and animal figures, no longer come in boxes covered in cellophane. • Acrylic (plastic) sign holders are being replaced with recycled or reusable materials. • “Green” products are now emphasized, such as reusable water bottles, eco-jewelry and toys made from materials like post-consumer recycled plastic, metal and sustainably harvested wood. 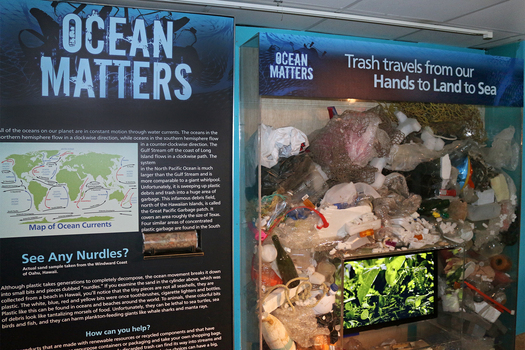 In addition to the changes in the Café and gift shop, The Maritime Aquarium has created displays about Americans’ excessive use of plastic water bottles and the larger problems of plastic pollution in the ocean. Also, a water fountain was repurposed to become a bottle-filling station, so that guests can easily refill reusable water bottles they bring during their visit. Learn more about The Maritime Aquarium, its exhibits and its conservation programs at www.maritimeaquarium.org.